We received regularly the request from owners of a Piper Meridian to add their aircraft to our fleet. They all showed interest to get an return of investment on their valuable asset by adding him to our pool of air taxi’s. After internal discussions we decided to offer the Piper PA46 Meridian next to our Cirrus SR22 product. This with the idea to offer an alternative for customers who want to travel with 4 or 5 people. 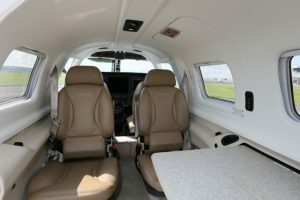 The Piper PA46 Meridian has received an hourly rate of € 800.00 per hour. The Cirrus SR22 is offered for € 580.00 per flight hour. To provide our customers througout Europe with flights on the Piper Meridian fleet, we were looking for multiple European based Meridian’s in addition to the current 2 that we added. Unfortunately, the Piper Meridian is not very well represented in Europe. Because of this we have not been able to offer the right scale so that customers in Europe had an aircraft in their neighborhood. After 2.5 years we decided to stop with the Piper Meridian fleet and continue to focus on our Cirrus SR22 fleet. The Cirrus SR22 has always been a successful aircraft since our foundation. At this moment we have 12 Cirrus SR22 aircraft in our growing fleet. Whether you are traveling from Berlin, Groningen, Rotterdam, Liege or Nantes, there is always a Cirrus from our fleet close by. To view where our planes are based, you can also check out our fleet page. If you are the owner of a Cirrus SR22 and you like to lower your direct operating cost, we are interested to add your Cirrus to our fleet. Please take a look at our website with the advantages of adding your Cirrus.